Senators passed several measures related to election law, including a bill that changes how legislative vacancies are filled. • after May 1, the appointee will serve the remainder of the legislative term before being subject to election. If a vacancy occurs on the University of Nebraska’s Board of Regents during the first year of a term or before Feb. 1 of a general election year, the appointee will be subject to election. If the vacancy occurs after Feb. 1 of an election year, the appointee will serve the unexpired term. Additionally, the bill makes several technical changes to filing requirements and the delivery and return of early voting ballots. The bill includes provisions of LB314, also introduced by Murante, which lengthen the time before an election during which a city must file a proposed economic development plan and increases the number of days prior to an election that an election notice must appear in the relevant newspaper. The provisions also allow the secretary of state to use general funds for maintenance and security of the state’s centralized, computerized voter registration list. LB451 passed on a 48-0 vote. A bill intended to ease ballot access for third-party political candidates passed this year. Under current law, a candidate who is a registered voter of a particular political party may be placed on a primary election ballot in Nebraska if the party received at least 5 percent of the total votes cast in either of the two previous statewide elections. LB34, introduced by Crete Sen. Laura Ebke and passed 48-0, automatically allows access to the primary election ballot if a party has at least 10,000 registered members as indicated by state voting records. LB85, introduced by Bellevue Sen. Carol Blood, prohibits any person with outstanding civil penalties issued by the Nebraska Accountability and Disclosure Commission (NADC) from filing for election to public office. A candidate with outstanding civil penalties can file for office if they have appealed the penalty and filed a surety bond in favor of the state, pending the appeal. The bill passed on a 48-0 vote. An attempt to override Gov. Pete Ricketts’ veto of a bill to immediately reinstate an individual’s voting rights upon completion of a felony sentence or probation fell short. LB75, sponsored by Omaha Sen. Justin Wayne, would have removed a current two-year waiting period required before former felons can vote. Senators passed the bill April 24 on a 27-13 vote. In his April 27 veto letter, Gov. Pete Ricketts said that requiring convicted felons to wait before allowing them to vote provides an incentive to maintain a clean record and avoid subsequent convictions. Wayne offered a motion to override the governor’s veto, saying the waiting period is outdated and creates barriers to reintegration into society. Senators voted 23-23 on the override motion, sustaining the governor’s veto. Thirty votes were required to override. 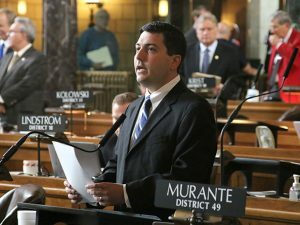 Senators also rejected a cloture motion during first-round debate on a measure that would ask Nebraskans to decide whether voters must show identification at the polls. LR1CA, introduced by Murante, would place a proposed constitutional amendment on the November 2018 general election ballot. If approved, the amendment would require voters in Nebraska to present an ID containing a photograph or digital image prior to casting a ballot. The Legislature would be tasked with determining the specifics of the voter ID requirement through enabling legislation. Murante offered a motion to invoke cloture, which would cease debate and force a vote on the measure. The cloture motion failed on a vote of 26-17. Thirty-three votes were needed. A bill to consolidate veterans’ services in Nebraska was given final approval this year. LB340, introduced by Gretna Sen. John Murante on behalf of the governor, transfers all programs, services and duties of the state Department of Health and Human Services Division of Veterans’ Homes to the state Department of Veterans’ Affairs, effective July 1, 2017. Division employees will be considered employees of the Department of Veterans’ Affairs after the transition and retain their rights and service under the state personnel system. LB340 passed on a 49-0 vote. Senators also approved a proposal to restructure the Nebraska Tourism Commission. LB222, introduced by Gering Sen. John Stinner, expands the commission’s membership from nine to 11 governor-appointed members. Four are required to have professional, volunteer or public-service experience related to the governance duties of the commission and seven must be affiliated with the tourism industry. The bill also requires an annual review, clarifies grant guidelines, requires the commission to adopt written policies governing expenditure of appropriated funds and stipulates that contracts awarded by the commission follow rules established by the state Department of Administrative Services. LB151, also introduced by Stinner, requires entities subject to a comment or recommendation by the state auditor of public accounts to electronically submit a written report detailing any corrective action it has taken or plans to take in response. State colleges and the University of Nebraska are excluded from the requirement. Agencies must submit the report no more than six months after the comment or recommendation was issued. The auditor of public accounts then will evaluate the report and submit findings to the governor and the appropriate legislative committee. The bill requires the auditor to deliver the report to the Legislature’s Appropriations Committee so that it may be entered into the record during the committee’s budget hearing process. LB151 also prohibits the auditor of public accounts from revealing sealed or confidential court records contained in working papers. The bill was amended to include provisions from four additional bills. LB27, introduced by Murante, allows the state auditor’s office to penalize governing bodies that do not provide the auditor with requested information regarding trade names under which the body operates and any interlocal agreements to which it is a party by Sept. 20 of each year. The auditor may assess a late fee of $20 per day, up to a maximum penalty of $2,000. LB89, introduced by Sen. Dan Hughes of Venango, reduces the period of public notice that a governing body is required to provide before holding a hearing on its proposed budget statement from at least five days to at least four calendar days. LB90, also sponsored by Hughes, requires a public entity under audit or examination by the auditor of public accounts to provide the auditor with accommodations at the location where the requested records are kept. The accommodations must include desks or tables and chairs, electrical outlets and internet access if it is available. LB101, introduced by Stinner, prohibits state agencies from extending a contract for services for a period of more than 50 percent of the initial contract term. Senators voted 49-0 to pass the bill. Various state-established boards and commissions were modified or eliminated by a bill passed this session. LB644, introduced by Murante, is the result of a statutorily-required review of all state boards and commissions that is designed to determine which of them are outdated or obsolete. Boards and commissions eliminated include the: community gardens task force; advisory committee for value-added agricultural promotion and development; Carbon Sequestration Advisory Committee; Perfusionist Committee; Nebraska Exchange Stakeholder Commission; Intergovernmental Poverty Task Force; Health Advisory Board; Medicaid Reform Council; Aging Nebraskans Task Force; Nursing Home Advisory Council; and Health Care Data Base Advisory Committee. A law enforcement officer may apply to have his or her home address withheld from the public under a bill passed this session. Introduced by Sen. Anna Wishart of Lincoln and passed 47-0, LB624 directs county assessors and registers of deeds to withhold from the public the residential address of a law enforcement officer who applies unless a member of the public requests the address in writing. Officers are required to renew their applications every five years. Lawmakers also passed a resolution to approve a gift from the Norfolk Veterans’ Home Foundation for construction of a park. LR251, introduced by Gretna Sen. John Murante, accepts the gift of $300,000 in material, labor and in-kind services so that a World War II and Korean War Memorial may be added to the Flag Plaza at the entrance of the Norfolk Veterans’ Home. The resolution was adopted on a 34-0 vote. A bill that would override individual city and local ordinances, making firearm regulations consistent statewide, remains on select file after being debated this session. LB68, introduced by Lincoln Sen. Mike Hilgers, would authorize the state to regulate the registration, possession, transportation, transfer and storage of firearms and ammunition. Cities and villages would retain the authority to enforce prohibitions on firearm discharge. As amended, the bill would allow a city of the metropolitan class to prohibit handgun possession in public places. Omaha currently is the only metropolitan-class city in Nebraska. Exceptions to the prohibition would include safe transport in a vehicle, possession for instructional purposes and possession by concealed-carry permit holders and military members. The open transportation of handguns and long guns within metropolitan class cities would be prohibited. The amended bill would require that openly transported firearms be unloaded and contained within an enclosed case or unloaded and broken down. There would be exceptions for open firearm transport by law enforcement, concealed-carry permit holders, military members and other lawful activity that does not endanger public safety and has received proper legal approval. Finally, it would require that firearms transported within a vehicle be unloaded and locked up, either in a trunk or a container other than a glove compartment or console. Concealed-carry permit holders and military members also would be excluded from this requirement. After six hours of debate spanning two days, Hilgers filed a motion to invoke cloture, or cease debate and vote on the bill. The motion succeeded 33-8. Senators then voted 32-12 to advance the bill but it was not scheduled for select file debate.